In the modern workplace which is increasingly global in nature, diverse individuals and ideas are often necessary to develop the best strategies to move an organisation forward. Therein lies the strength of Siemens, where diversity is as much about ideas as it is about people, and where the creative potential of this diversity is tapped for maximum advantage. “When we put our thoughts together as a team of diverse people coming from diverse backgrounds, all thinking outside the box, you get a team that is a hundred per cent effective. No individual can be a hundred per cent efficient, but a team can be. It is this kind of team which Siemens is building,” said Prakash Chandran, President and CEO of Siemens Malaysia and Executive Vice President & Head of Siemens Energy Sector, ASEAN Cluster. Prakash says at Siemens all values are expressed through diversity. In his presentation to hundreds of INTI students that was part of INTI’s Business Leadership Series (BLS), Prakash also shared his insights on creating an open and inclusive environment where real talent has no boundaries and every individual has the potential to contribute to success. 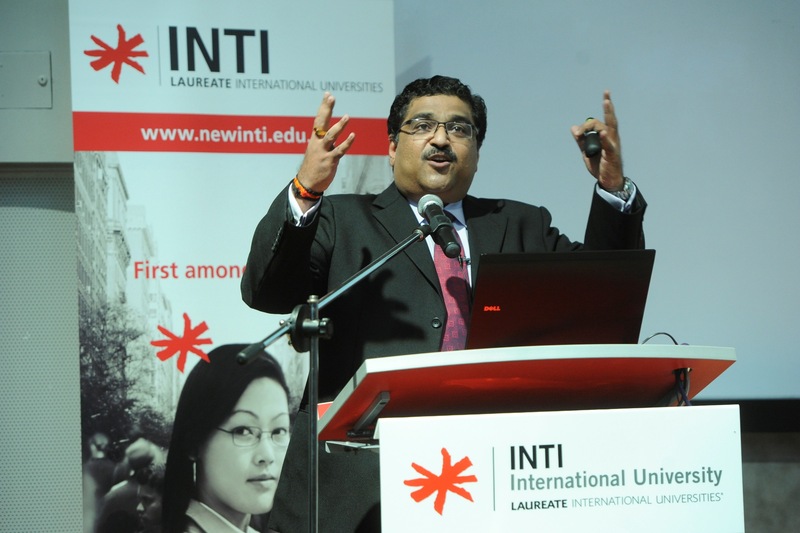 Delivered in a packed lecture theatre at INTI International University in Putra Nilai, Prakash’s address was also viewed via live stream by students and staff at INTI’s campuses nationwide. The BLS provides INTI’s 14,000 strong student community an opportunity to engage with the industry in addition to having real time dialogues and debates on topical issues. “We have offered the Business Leadership Series since last year on an almost monthly basis, and have featured industry leaders such as Dell’s Bobbi Dangerfield, Microsoft Malaysia’s Ananth Lazarus, Malaysia Airlines’ Tengku Dato’ Sri Azmil Zahruddin, IBM’s Ramanathan Sathiamutty and many others. They have been very inspirational and we have had tremendous feedback from students, who are truly inspired by these presentations and the opportunity they have to rub shoulders with such accomplished leaders,” said Graham Doxey, CEO of Laureate Malaysia and Deputy CEO of INTI. Doxey added no other post secondary institution in Malaysia offering this level of exposure to this level of community and industry leadership on such a regular basis. He explained that the series was part of INTI’s initiative to bring industry into the classroom under its Enrolment to Employment (E2E) programme and help shape students into becoming highly employable upon graduation. Students of INTI benefit not only from its 25 years of experience and strong track-record, but also gain from the global synergy and resources that Laureate International Universities provides. INTI is part of Laureate, the world’s largest private education network with a presence in 28 countries, with more than 60 accredited universities and 130 campuses, serving more than 650,000 students globally.